Warm and glowing greetings from BBB. This week I’m going to share my favourite chilly January beauty tip: go on holiday! Simple as that! There’s nothing like white sands, turquoise seas and deliciously warming sunshine to lift your spirits and get you looking gorgeously tanned and glowing again. Sadly, I haven’t been able to follow my own advice and jet off to sunny climes as yet this January. But luckily, with the right products, it’s easy to fake that heathly post-holiday glow. Regular readers will know what a massive fan I am of bronzing powder – it’s definitely my desert-island product (though, frankly, even I wouldn’t need bronzer on a tropical island), but I’ve also discovered a few other amazing beauty boosters that help create a bronzed and beautiful look. Smooth primer across your whole face. This will illuminate your complexion and create a perfect smooth base for your make-up to sit on. A primer creates a layer between your skin and foundation so your skin doesn’t get clogged up. Using a primer will also help your makeup last longer. You only need a small amount of this Stila product – All Over Shimmer Liquid – I apply it underneath my brows and on my cheekbones, but you can blend it all over the face for extra shimmer at night. Using a shimmer or illuminator will freshen and brighten your face and give your skin a dewy, youthful sheen. Swirl your brush in your bronzer and tap off any excess powder. Now lightly brush the bronzer across the apples of your cheeks, your forehead and down your nose, and to any other areas where you want to add a hint of colour. It’s a good idea to shop around and find the perfect bronzer to suit your skintone. I adore this BareMinerals All Over Face Colour in Faux Tan but depending on your colouring you may want a bronzer with more pink tones or more golden tints. The aim is to create a natural, sun-kissed look so the shade of your bronzer should be similar to the colour of your skin with a natural light suntan. I just love this product because it lifts and brightens winter-dulled skin, making you look flushed and healthy even if you haven’t seen a ray of sunshine for months. I always use bronzer – even when I’m only pairing it with a slick of mascara. It wakes up my face and gives my look a real boost. Lastly, a slick of pink lipstick or lip-gloss is the finishing touch to complete your bronzed look – Too Faced La Crème Lip Cream in Coral Fire has the perfect warm coral tone. Apply straight from the tube and use your fingers to blend it in so the end result is a natural touch of colour rather than a perfect lip. This is all about creating an easy, healthy sheen so aim for natural-looking results rather than prim and perfect make-up. And that’s it – four quick steps to a gorgeous sun-kissed complexion. If you’d like to watch me creating my winter-sun face, watch my step-by-step guide to bronzing above. Don’t forget to let me know if there’s a make-up look or beauty trend you’d like me to video or blog about by commenting below, or emailing me at binky@escentual.com. 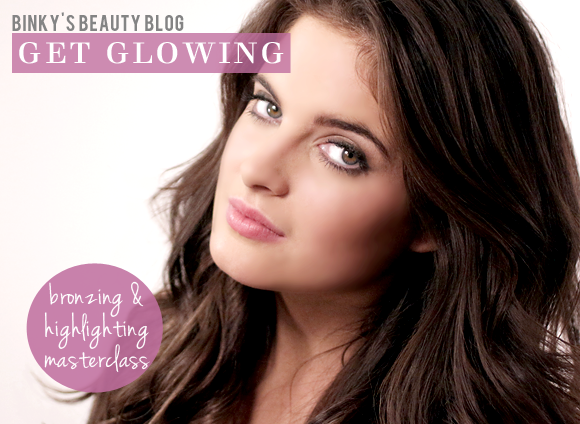 Go on – glow for it! Really easy to use, it does exactly what I wanted it to. I'm not always a fan of using blusher or bronzer and this product allowed me to reach that definition, whilst retaining a natural look. This entry was posted on Friday, January 25th, 2013 at 1:54 pm and is filed under Binky's Beauty Blog #BBB, Get the Look, Make-up, Tried & Tested, Video. You can follow any responses to this entry through the RSS 2.0 feed. You can skip to the end and leave a response. Pinging is currently not allowed.